I may serve in return for your gift. [on] different rounds of the spiral. and vortices or whorls [of energy in motion]. Practice [with the runes] to find out. And I will guide you. How to transcribe what you receive in such instances? Well, the obvious answer is this: you do the best you can. And you ask, usually more than once, for clarification. Let me puncture any mystery here: the words I attribute above to Thecu came during three intervals. The first and second, along with runes, over the past week, in two separate periods of meditation. The first led to the insight that Thecu was offering guidance on how to walk “nine paths of storm”, and a preliminary sense of what that might mean. The first five runes also came then, drafts scribbled on scrap paper, as I tried to get their shapes to match the different flows of energy my inner experience felt like it conveyed. The same thing a second time, two days later. Then this morning: I already knew I was going to write about this, and I’d made a draft, along with the admonition I’d received not to share except in general terms the insight of the runes. So in about five minutes the above lines came, as I attempted to pull together fragmentary notes about the runes and render the impression of those meditation sessions into something more like continuous speech. Are they “the words of the goddess”? Sure. Also, no and yes. In keeping with the deep wisdom of unverified personal gnosis (UPG), they’re meant to be tested and tried out, to see how their truths work for me. One key to practice, and it can be disconcerting, is to shift from “UPG mode” to “critical thinking mode”. I get this stuff in ways similar to how I get pieces of poems and stories. And it’s the same kind of thing: then you have to figure out what to do with them. Sometimes the message, image, metaphor is clear. Other times, it needs shaping or untangling. And to keep honest about proportions of these things has indisputable value, but not — it needs to said as well — spiritual primacy. The impulse-message-insight-inspiration needs to get recorded before, like such things do, it flows away like cloud. And I share this experience for what it’s worth to others who may encounter similar impressions, nudges, doubts and insights. What to make of such things? For me, it’s to see how and where they might fit in living my life, and whether their usefulness, if any, merits passing along anything about them to others. So I serve notice here most of all to myself. Any value to this experience will emerge, or not, in and over time. And I will try to report that here. Image: stormcloud — “free for commercial use”. We can of course take an a-gnostic approach to all of the above as well: I sense changes coming (no surprise at all, given the state of the world!) and my imagination/subconscious is throwing up images, ideas, tools, hints to help me deal with them. Useful, wholly apart from the nature of their origin, because they’re intended to be empirical: their value lies in what they can do, what I can do with them. Who says the imagination or subconscious has no practical value? In some ways, that’s the ONLY thing it has. How do I pray to you, goddess of storms? Let this my prayer be a litany of questions. How may I best honor you? with this foreign name to call you. make yourself known to me? a god’s service, formal prayer. Then, too, I know so little of you. of doubts and questions be first prayer. In the single experience (see recent post) I had of her, Thecu was particular about the sound of her name: TEH-koo, spelt with a c, not a k. Something bleeding through here of eastern Europe: Thracian, Dacian, Illyrian, Macedonian Greek, Etruscan? The linguist in me still turns over these very scant details. This is one of those shadowy regions of Europe, where we know so little, mostly echoes from the written histories of neighbors, along with a few hundred words, a handful of inscriptions. 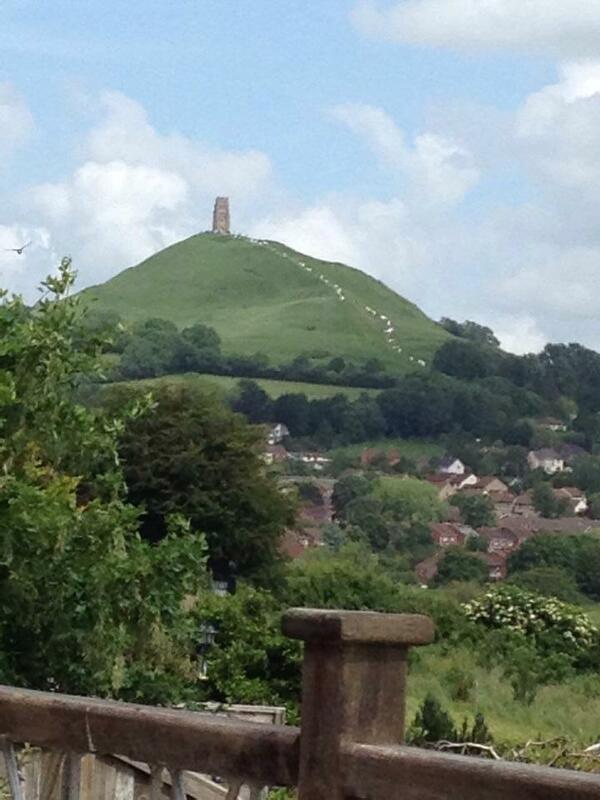 Does it matter whether Druids and Glastonbury share a historical connection? Ultimately, only to historians. The lived experience of Druidry, as of any flourishing tradition, means that what we do today shapes our experience more than what may or may not have happened in the past. When my fellow Druids assembled in the town and on the Tor, the sense of community, the sharing of ritual, the reunion of friends, the inspiration of the talks and workshops, the sense of history, and the beauty and much-vaunted “vibe” of Glastonbury, all converged. And the same kind of convergence is true of personal experience as well. Though OBOD’s Golden Anniversary celebration tugged deeply at me, my wife and I had already committed resources to a trip within the U.S. I couldn’t manage both, so I had to forgo what was by all accounts a moving and delightful celebration. 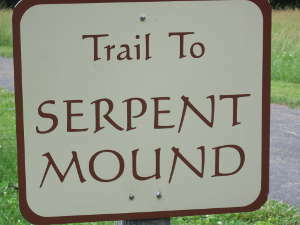 But I couldn’t sustain much self-pity, because our own itinerary included a return to Serpent Mound in southern Ohio. I’d visited before in 2008, and experienced a strong past-life recall there. I saw and heard further details this time. Among them were a specific name (of a tribe? a person? I don’t — yet — know), voices singing, images of the tribe’s shaman, and of my death near the Mound in an inter-tribal conflict. 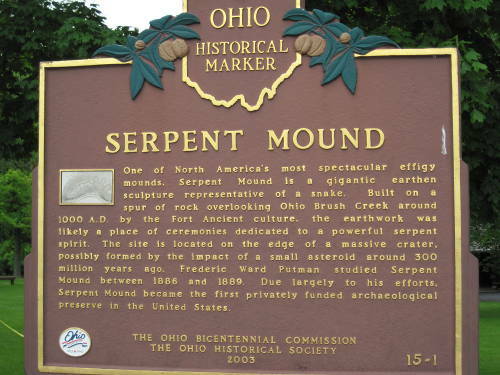 The Serpent is “a 1,348-foot (411 m)-long, three-foot-high prehistoric effigy mound located on a plateau of the Serpent Mound crater along Ohio Brush Creek in Adams County, Ohio” (Wikipedia entry, and the sign above). On the ground, it’s not a particularly impressive structure — at first. A 30-foot viewing tower near the tail of the Serpent allows some height and perspective for the kind of photos I took. Shadows in pictures taken early or late in the day help highlight the shape and outline of the Serpent. Both the age and purpose of the Mound are a matter of debate. Many published sources estimate the time of its construction around 1000 or 1100 CE. 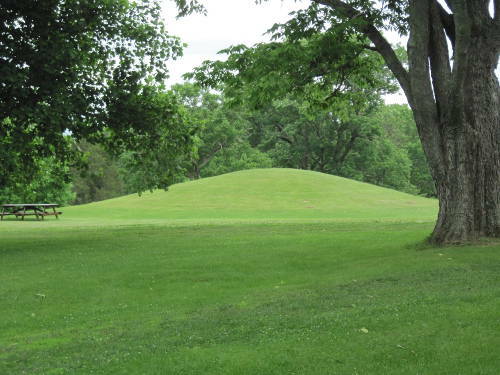 But the Ohio Historical Society guide at the site assured us that recent archeological studies, due to be published later this month, revive the claim (with apparently solid evidence) that the mound dates from an earlier period around 2000 years ago. Artifacts recovered from the mound include charcoal, beads and other jewelry, flint knives and arrow-heads, and deer-bone tools. 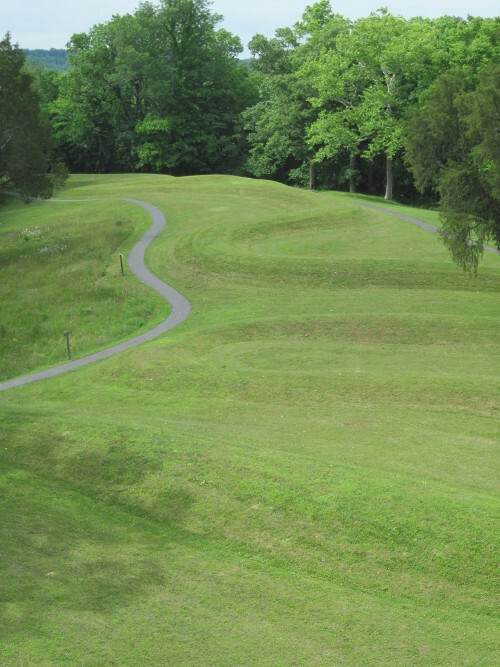 Add to this the presence, both at Serpent Mound and elsewhere in Ohio, of separate conical mounds like the one below (the picnic table in the foreground gives an approximate yardstick to estimate its size), and for me at least the sense of Adena tribal presence and purposefulness grows in my heart, a living thing. 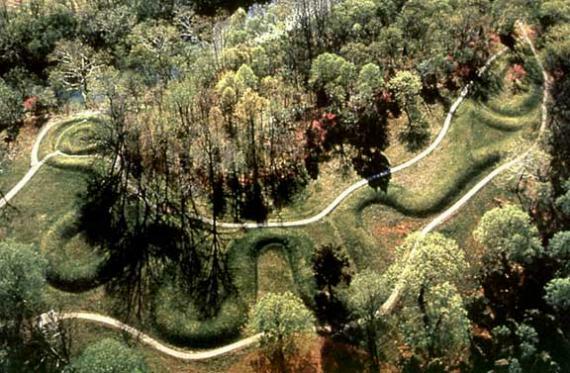 Image: Aerial shot of the Mound. All other images by me.